Game of Thrones® pack sent to influencers and superfans in Spain. Game of Thrones® season 7 has finally hit the screens. Earlier this week Tourism Ireland unveiled its brand new Game of Thrones® campaign to showcase Northern Ireland once again to millions of fans worldwide. To complement the global campaign and to celebrate the launch of season 7, Tourism Ireland in Spain rolled out a fun promotion this week – targeting social media influencers and GoT ‘superfans’ who have a combined audience of over 4 million. 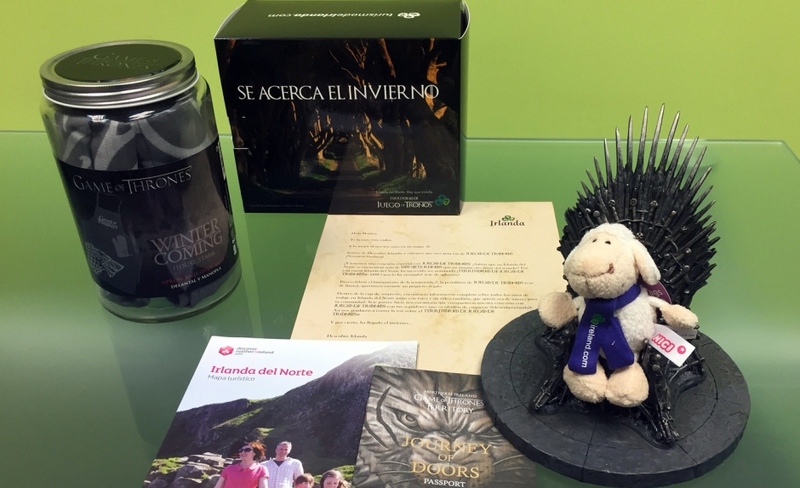 Special Game of Thrones® packs were sent to the influencers; these included a personalised letter and gift, a Game of Thrones® Passport and even a Tourism Ireland sheep on the Iron Throne (which ensured some great photos were subsequently shared! ), as well as a video and lots of information about the filming locations around Northern Ireland. The objective was to get the influencers to share the contents of their Game of Thrones® pack with their followers – and to convince those followers to come and visit the real-life filming locations. Designed to bring a smile to the faces of the recipients, the packs have been getting a great response, including from Spanish film director Santiago Segura, who shared a photo with his 3.3 million followers on Twitter.